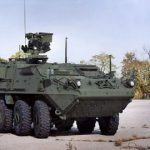 General Dynamics‘ (NYSE: GD) land systems subsidiary has received a potential five-year, $402.1M contract to provide technical support services for the U.S. Army’s fleet of Stryker ground combat vehicles. Work under the cost-plus-fixed-fee contract is scheduled to conclude Jan. 31, 2024, the Department of Defense said Thursday. The Army will determine funds and performance locations with each order. Stryker vehicles are built on a common chassis and designed to function as “the backbone” of the military service’s medium.